Western designer purses from Mission Del Rey are very popular for their classic western style. Many of these western style purses are created using PU leather. Polyurethane leather is a unique process of using real bonded leather for a base and then creating fabulous textures and rich color. Some designer purses also use genuine cowhide to create a truly western look. 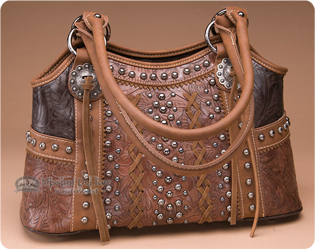 Shop for western purses online and discover the variety you are looking for to find that special handbag for yourself and choose the classic embellishments like rhinestones, studs and conchos.